Our 7 day weather forecast for Keswick updated throughout the day, making it ideal for planning leisure activities, travel and events. Read more about our weather forecasts. On Monday 22nd April 2019 the sun will rise at 05:55 and will set at 20:29. It will be a mild day, with temperatures reaching around 20.8°C. Today is expected to be a dry day, with a very low chance of rain. It will be quite a breezy day, with a maximum expected wind speed of 21mph. On Tuesday 23rd April 2019 the sun will rise at 05:52 and will set at 20:31. It will be a mild day, with temperatures reaching around 19.6°C. Today is expected to be a dry day, with a very low chance of rain. It will be quite a breezy day, with a maximum expected wind speed of 15mph. On Wednesday 24th April 2019 the sun will rise at 05:50 and will set at 20:33. It will be a mild day, with temperatures reaching around 16.4°C. Heavy rain which could cause some standing water is expected, 12mm of rainfall is possible today. It will be quite a breezy day, with a maximum expected wind speed of 20mph. On Thursday 25th April 2019 the sun will rise at 05:48 and will set at 20:35. It will be a mild day, with temperatures reaching around 13°C. A light shower is possible, 1mm of rainfall is possible today. It will be quite a breezy day, with a maximum expected wind speed of 21mph. On Friday 26th April 2019 the sun will rise at 05:46 and will set at 20:37. It will be a mild day, with temperatures reaching around 10.9°C. Some moderate to heavy rain is expected, 6mm of rainfall is possible today. It could be quite a gusty day today, with a maximum expected wind speed of 25mph. On Saturday 27th April 2019 the sun will rise at 05:43 and will set at 20:39. It will be a mild day, with temperatures reaching around 10.8°C. Heavy rain which could cause some standing water is expected, 13mm of rainfall is possible today. It could be quite a gusty day today, with a maximum expected wind speed of 31mph. On Sunday 28th April 2019 the sun will rise at 05:41 and will set at 20:41. It will be a mild day, with temperatures reaching around 3.9°C. Today is expected to be a dry day, with a very low chance of rain. There will be a gentle breeze in the air today, with a maximum expected wind speed of 18mph. Our weather forecast for Keswick is updated throughout the day and has been found to be very reliable for planning activities such as days out, leisure, travel, events, fishing, golf and gardening. 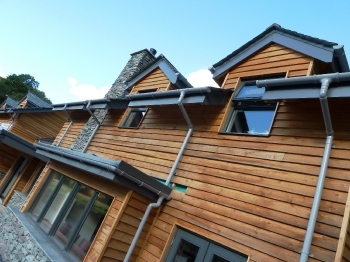 Built in 2010 in the heart of the Lake district National Park, is the stunning Lodge in the Vale. Located between Keswick and Grasmere just off the main A591, it is in one of the most picturesque locations in the area. The Lodge has been fitted out in a modern contemporary style. All bedrooms are fully en suite with internet access, direct dial telephones and flat screen satellite TV. Bedrooms are a mixture of double, twin and family to cater for all combinations of groups or individuals. On entering The Lodge guests will immediatley be struck by how beautifully light and airy the building feels. This is created by the two story glass atrium in the lobby and reception area. Although The Lodge does not offer full meals - continental breakfast is included in the room rate - The Kings Head Hotel - which is under the same ownership and is a two minute drive from the Lodge - serves all day gastro bar meals and also boasts a fine dining restaurant The St. Johns - which are available to guests staying at the Lodge. Surrounding The Lodge is some of the finest scenary in the Lake District. Direct access to Helvellyn can be gained Via the white stones route just South of the Lodge adjacent to The Kings Head Hotel. The Northern fells of Skiddaw and Blencathra rise in the distance creating the perfect backdrop to any Lake District break or holiday.